Welcome to the new Cheap Chills web store! We're excited to announce that all the apparel below is fulfilled through Amazon.com. That means you get all the great customer service that comes with buying from Amazon. Easy returns, free shipping for Prime members, all that stuff. Oh and just clicking through and shopping as usual for whatever you want from Amazon's vast catalog actually gives us a lil' boost too, at no additional cost to you. P.S. This is just a taste (slurp!) In Amazon, click the Cheap Chills brand name for more color-ways and cuts. Weathered print makes it look like you were totally a fan of the podcast before there was one. A groggy, undead skull face, dead to the world before coffee. This Tee is perfect if you are so sleepy you literally have cobwebs in your eyes. The greaser pompadour is not required. Makes a great gift for your mom, dad, husband, boy-friend who loves caffeine, creepy horror movies, rockabilly and monsters. 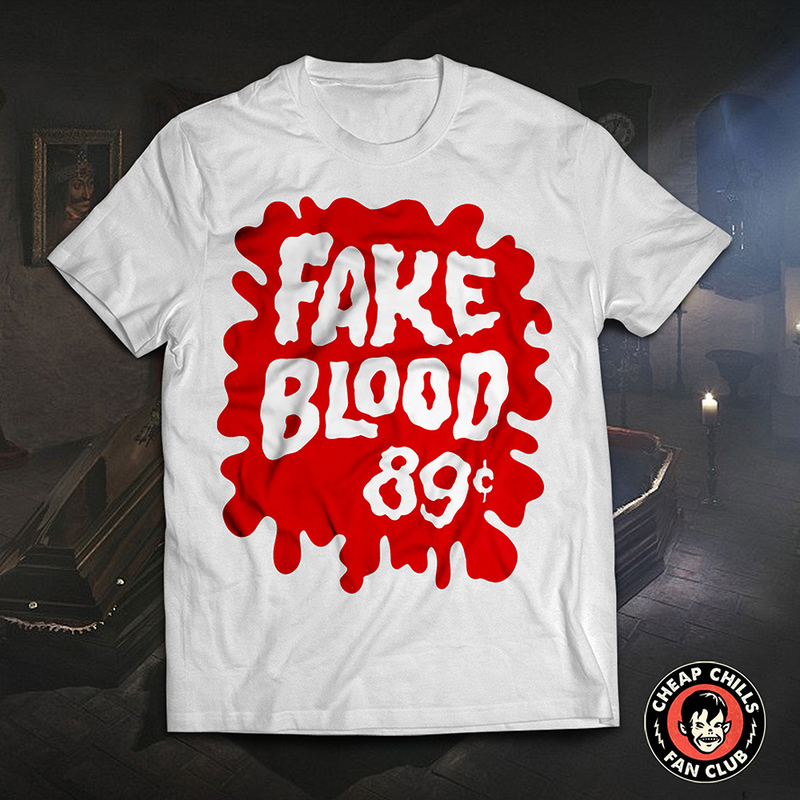 Relive your childhood in this vintage style Fake Blood shirt. 89 cents. If you grew up in the the 60s,70s, or 80s your Dracula Vampire costume was not complete without fake blood. Wear this retro Tee to a Halloween party or while you hand out candy to trick-or-treaters. A great gift for a goth monster, macabre friend or family. member. Inspired by Nosferatu, the classic, silent horror film about an ancient rat-like vampire who is definitely not Dracula. Print has the half-tone dotted pattern for a vintage look. You can almost smell the gum (not included). This tee shirt has that retro collectible card look and features an alien, Martian ray-gun and vintage-style graphics. Featuring our lovable....bat-eared weirdo, Grigor. Now you can dress just like Jon Cryer! Sure you already had your "Ducky from 16 Candles" phase but what about Jon's look from 1987's Hiding Out? A swamp monster from a lagoon that may or may not be black. Inspired by vintage children's halloween costumes. Outlaw! Inspired by classic biker monster movies of the 60s and 70s like Werewolves on Wheels and Psychomania. Outlaw is an undead mummy, clad in leather and riding hard. Nothing is more universal than morning breath, and no one has worse breath than a werewolf! Inspired by vintage children's halloween costumes.